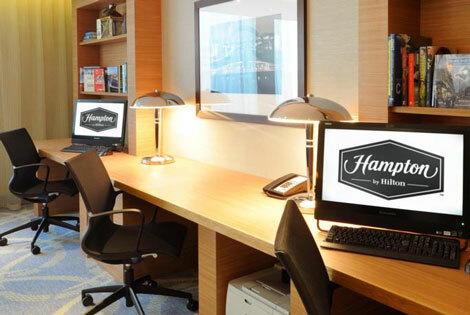 There are over 2,000 Hampton by Hilton properties worldwide (the majority in the US), making it the largest brand within the Hilton Worldwide family. 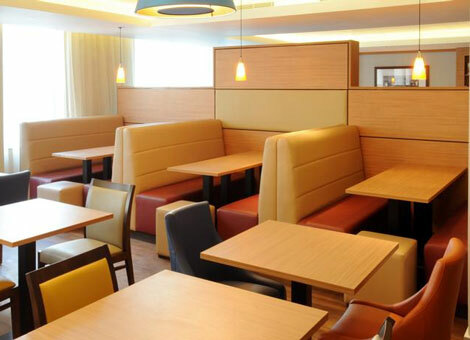 The “focused service” brand entered the UK market in 2009 with the 88-room Hampton by Hilton Corby (see news March 2009), and there are now 17 properties throughout the UK, including Birmingham, Bristol, Gatwick airport, Liverpool, London Waterloo and Luton airport. New UK properties set to open this year include Glasgow in May, Dundee in July, and Bristol Airport in December. 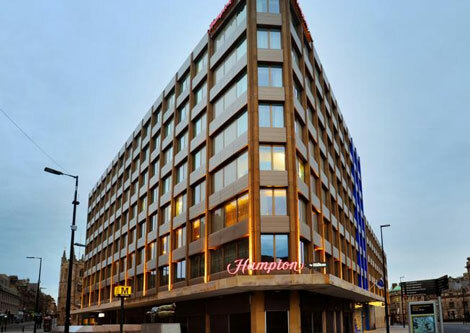 Hampton by Hilton Newcastle opened in March 2015, joining the Hilton Newcastle Gateshead and the Doubletree by Hilton Newcastle International airport. Opposite the entrance to Newcastle’s main Central rail station, which is also on the city’s Metro line, with direct access to the city’s airport. The hotel is housed within a converted office and call centre building – the first two floors of the property are taken up by a pizza restaurant (currently being built, hence the rather ugly looking black boarding around the ground floor), and a Slater’s menswear outlet. Guests take the lift to the second floor, where all of the hotel’s public facilities are located. 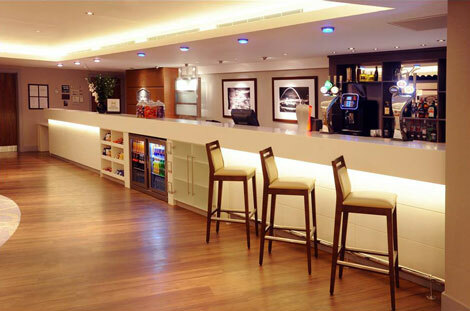 The reception area doubles up as a 24-hour market with snacks, toiletries, etc, and further along a bar area. Keycards are required to take the lift past the second floor to the rooms. 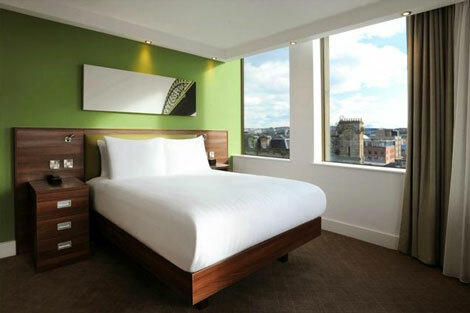 Rooms are smart – simple in design with whites, browns and lime green being the predominannt colour scheme, and in my room there was a canvas above the bed showing an image of one of Newcastle’s iconic bridges. Facilities include either a twin (120cm) or double (150cm) bed, workdesk with a comfortable chair, lounge seating and foot stool (accessible rooms have a sofabed), alarm clock and radio, tea and coffee facilities, safe, iron and ironing board, hairdryer, lot of plug sockets, and a walk-in shower (no bathtub), with Purity Basics toiletries dispensed from containers attached to the wall. There is no minibar or empty fridge. The sliding door to the bathroom also serves as the door to the cupboard space next to it – not a problem if you are staying in the room by yourself, but on one occasion I opened the bathroom door only to close the door on the cupboard while my partner was trying to get something out of it. There is a 32-inch HDTV, which can display music, photos and other media from your smartphone or tablet – I tried it using my iPhone and it worked fine, but it didn’t want to recognise my partner’s Samsung Galaxy Alpha. Free wifi is a brand standard for Hampton by Hilton, and I found it was good enough to stream a TV programme through my tablet for the 10-15 minutes that I tried. My room was on the seventh floor, and from the window I could see over Central station to the new Crowne Plaza Newcastle Stephenson Quarter on the other side – for a review of this property click here. Free breakfast is another brand standard for Hampton properties, with guests helping themselves from a room (referred to as Aladdin’s Cave) past the seating area. There was a good selection, from hot dishes to fruit, cold meats and cheeses, cereals and pastries, and a waffle machine which my partner enjoyed. The hotel’s bar is attached to the reception, along with the 24-market shop which sells toiletries and other essentials. A full bar menu including staple dishes such as burgers, lasagne and fish and chips is also available from here between 1100 and 2230, and then a limited night-time menu is offered (including paninis and pizzas) through till the morning. There is plenty of seating past the reception, including a large circular booth for groups – there is no room service, but guests can call through to reception and place their order, and they will then be called back when it is ready so that they can go down and collect it. There are no official meetings rooms at the hotel, but there is a business corner past the bar and restaurant, with a boardroom-style table which can be used on a first-come-first-served basis. This area also has two large-screened PCs, and printing facilities. Free wifi is available throughout the hotel. 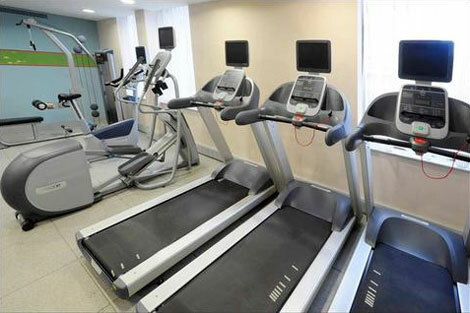 There is a gym on the second floor, with Precor equipment and natural daylight. Convenient location opposite the city’s main rail station, and good facilities for this level of hotel, including a fast internet connection, free breakfast and a powerful shower. Internet rates for a flexible midweek stay in April started from £85 (£82 if booked as a Hilton HHonors member) for a Queen room.